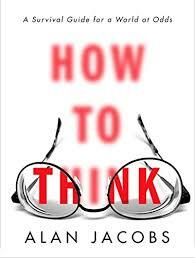 My review of Alan Jacobs' How to Think is up and running at the American Interest. It's my first time writing for them, and I've been impressed by the quality of their publication. I admire Jacobs as a writer and thinker, but I came away from How to Think with mixed feelings. Though the book contains exactly the right kind of advice for our distracted, tribal age, the form of Jacobs' argument--scattered, unnecessarily redundant, and circuitous--works against the very good habits he wants to inculcate in his readers. The American Interest allows two free articles per month without a subscription, so if you're looking for another offering, check out Sean Keeley's thoughtful take on Ross Douthat's most recent book on Pope Francis.